Equipped with many different safety features the X-plore 1320 is a reliable and comfortable disposable face mask from Drager Safety. Features include a CoolMAX exhalation valve which releases hot, humid air from the mask and a VarioFLEX head harness which prevents hair entanglement. 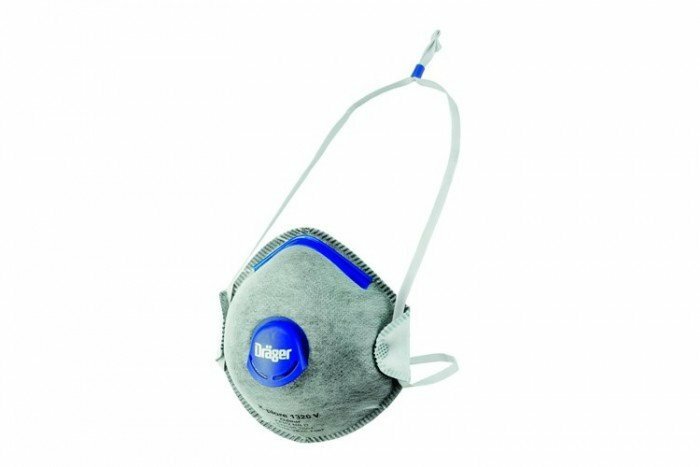 This particular X-plore 1320 FFP2 disposable face mask from Drager Safety is equipped with many different features to enhance the comfort of the wearer. It includes a nuisance odour layer and a CoolMAX exhalation valve and comes in a pack of 10 pieces. The nuisance odour feature works through an activated carbon layer. This layer filters out any nuisance odours and unpleasant smells and makes it much easier for the user to breathe. This is particularly effective is industries such as recycling and waste separation. The other additional feature on the X-plore 1320 mask is the CoolMAX exhalation valve. This is placed on the disposable mask to strategically remove any exhaled hot air and allow the wearer to stay cool. It prevents heat build-up can effectively keep the wearer comfortable during use.